The Owls practiced for two and a half hours behind the Tom Oxley Center in helmets and shoulder pads for the first time this spring. Lucky Whitehead will finish the season sixth in the FBS in total punt return yards with 311, and fourth in the FBS in average yards per punt return with 16.4. In head coach Charlie Partridge and his coaching staff’s second season at FAU, the Owls looked faster and deeper today at the annual Red-Blue spring game as the Blue team defeated the Red team 31-21 at FAU Stadium. With injuries a concern, Partridge decided to play some players on both teams during the game. One of the storylines in today’s game was the backup job to presumed starting quarterback Jaquez Johnson. Highly touted freshman Daniel Parr Parr played for the Red team and lived up to the billing as he threw two touchdown passes. His first was a 17-yard touchdown pass to Kamrin Solomon to tie the game at 14 early in the second quarter. His second was a 47-yard strike to Bobby Mitchell in the second half to score the Red team’s final points. The backup quarterback last season, Hankerson has been in a very tight battle this spring with Parr and Driskel to keep the role. Hankerson scored on a 65-yard touchdown run on the second play from scrimmage to give the Red team a 7-0 lead. Jason Driskel staked his claim for the role as he used his legs and arm effectively throughout the game and connected with Jenson Stoshak for a 16-yard touchdown pass in the second quarter. “You have a battle for that second quarterback spot between all three of them,” said Partridge. Starting quarterback Jaquez Johnson and the Blue team looked in sync to start the game as they scored on two straight scoring drives to start the game with him running the offense. The first was an eight play, 80-yard touchdown drive with Greg Howell bruising through tacklers from two yards out. The second scoring drive was capped by a Howell score from inside the five but not before Johnson connected with Nate Terry for 20 yards to enter the red zone. “He’s someone who can make some big plays,” said Partridge on Terry’s performance. Although the defense looked spotty at times during the game, many of the players who would be starting on defense were held out for precautionary reasons. Starting linebacker Robert Relf and starting defensive lineman Brandin Bryant both did not play. One of the new faces to take advantage of the opportunity was redshirt freshman defensive lineman Winston Chastang who recorded the game’s first sack against Greg Hankerson (photo), and one of the Owls' three on the afternoon. On the offensive side of ball Partridge held out running back Jay Warren for precautionary reasons, which opened the door for freshman Trey Rodriguez. Rodriguez was able to flash some of his potential for FAU fans as he made several guys miss in the open space and displayed great hands while catching screen passes. 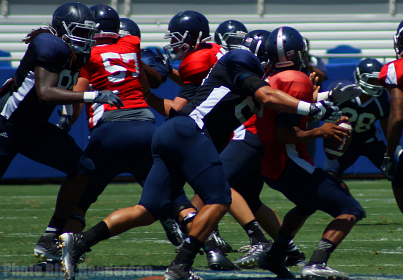 The FAU Spring Game did not contain any kickoffs, and no punts were allowed to be returned. Each offense, after every scoring drive, started at the 20-yard line. In game highlights and commentary can be found here.